UPDATE: Federal Judge Sandra Armstrong on June 18 ordered Eureka and Arcata to cease and desist from any enforcement of the Youth Protection Act. Both cities have declared their intention to appeal her ruling. The legal jousting is just beginning. and Arcata, will have significant ramifications for the military's recruitment policies, and for the ongoing political defense of JROTC (Junior Reserve Officers' Training Corps). 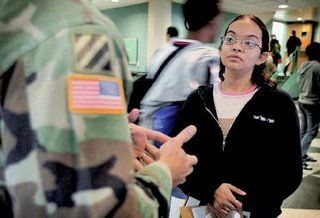 The California state legislature, currently considering three bills that would grant special treatment to JROTC, one of the Pentagon's favorite military recruitment programs, may find itself dragged into this battle if it gives its seal of approval to any of these bills. In 2002, the U.S. Senate ratified an international treaty that outlaws the recruitment of child soldiers. 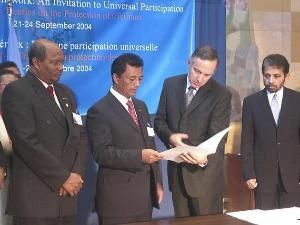 By signing on to this treaty, called the "Optional Protocol to the Convention on the Rights of the Child," the U.S. agreed not to recruit youth under the age of 17. "JROTC is one of the best recruiting devices we could have," according to former Defense Secretary William Cohen, who served under President Bill Clinton. The JROTC program primarily targets high school freshmen and sophomores, students as young as 14 and 15, well below the age of 17. In Chicago and some other cities, JROTC runs the Middle School Cadet Corps that includes children as young as 11. Under the U.S. Constitution, an international treaty is "the supreme Law of the Land; and the Judges in every State shall be bound thereby, any Thing in the Constitution or Laws of any State to the Contrary notwithstanding." So reads Article VI, paragraph 2, known as the Supremacy Clause. As plain as the Supremacy Clause is, "not every judge may know this," according to Ann Fagan Ginger, a renowned expert in international law, and the founder and director of the Meiklejohn Civil Liberties Institute. The legal doctrines involved in fighting over international law in U.S. courts can be problematic, but the Pentagon seems to have shot itself in its foot in this case, having dragged two California cities into court, and virtually inviting them to raise the issue of military recruitment and the federal government's treaty obligations. In November 2008, voters in both Eureka and Arcata passed nearly identical versions of an initiative called the Youth Protection Act. This initiative, sponsored by a coalition calling itself Stop Recruiting Kids, provides that "No person who is employed by or an agent of the United States government shall… in the execution of his or her job duties, recruit, initiate contact with for the purpose of recruiting, or promote the future enlistment of any person under the age of eighteen into any branch of the United States Armed Forces." Eureka voters passed this law with a solid 57% majority. In Arcata, the act passed in a whopping 73% landslide. Both laws went into effect in early December. Just days later, both cities received letters from the U.S. Department of Justice, acting on a complaint from the Department of Defense, declaring the U.S. government's intention to go to court to overturn the two local ordinances. 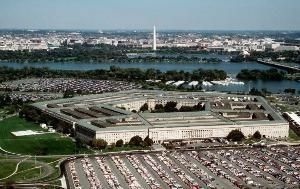 Both cities are mounting an aggressive response to the Pentagon's lawsuit. Arcata is represented by Brad Yamauchi of the prestigious San Francisco law firm of Minami and Tamaki, and by attorney Michael Sorgen. Eureka is being represented by their City Attorney, and by Dennis Cunningham. Cunningham, a noted San Francisco National Lawyers Guild attorney, famously won a multi-million dollar civil rights case against the FBI and the Oakland Police on behalf of environmental and labor activists Judi Bari and Darryl Cherney. The legal defense team for the Youth Protection Act is off and running. Arcata has filed a counter-claim to the Pentagon's suit, declaring that the Youth Protection Act is perfectly legal. The city claims that the act does not "discourage military enlistment, but instead, the purpose was to protect the health and safety of easily-influenced young people who are still too young to make decisions on military service… and to protect its youth from known and real abuses in military recruiting. "Significantly, the counter-claim also argues that any attempts "to recruit minors into the military are… in violation of a treaty ratified by the United States Senate [the Optional Protocol]… The Protocol serves to protect children from 'recruitment, training, and use' in armed forces." The counter-claim was filed at the end of March, and is being heard in federal court in Oakland. Neither the Pentagon's suit, nor the counter-claim, mentions JROTC. But JROTC was blasted as a violation of this very same treaty in a report issued last May by the American Civil Liberties Union (ACLU). The report, called Soldiers of Misfortune, states that the "United States military's procedures for recruiting students plainly violate internationally accepted standards and fail to protect youth from abusive and aggressive recruitment tactics," according to Jennifer Turner of the ACLU Human Rights Project. As this high-profile case winds its way through the courts, it is bound to attract the attention of the sizeable body of opponents of the rampant abuses of the military's recruiters, stretched thin in this era of endless war in Iraq, Afghanistan and beyond. It is likely to also draw the attention of the international bodies charged with the enforcement of the treaty. A recent report of the NGO Group for the Convention on the Rights of the Child, for example, questioned the US insistence that "recruitment" only covers the final induction of youth into the military. 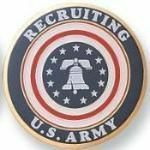 "The Committee asked about the exact definition of recruitment," the report reads, "since it seemed to cover only the final entry into the armed forces, not the targeting of much younger children." The same committee also "noted that many students, including some as young as eleven were enrolled in the Junior Reserve Officers' Training Corps." The US delegation responded that "JROTC was not a recruitment program, but aimed to develop citizenship and responsibility and increase the number of children finishing high school particularly among underprivileged youth," i.e. working class youth, particularly youth of color. In less diplomatic language, that dog just don't hunt. The CALIFORNIA STATE LEGISLATURE to BRING THE WAR HOME? Nobody expects this court battle to end in a hurry. The Pentagon certainly won't quit easily. But neither are the forces lined up on the other side likely to say uncle any time soon, either. And, already, there is talk of other cities around the state mounting their own campaigns for their own Youth Protection Acts. Military recruitment of children is not very popular anywhere. In this environment, just what happens if the state grants protected status to JROTC? That's exactly what they are being asked to do by way of Assembly bills AB 223, AB 351 and AB 554. 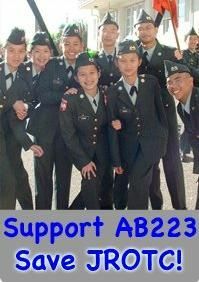 AB 223, authored by Fiona Ma (D-San Francisco) would mandate that San Francisco keep its JROTC program, scheduled to be phased out this June. Ma's bill is an unprecedented violation of local control of schools, would make San Francisco the only city in the nation that is required by law to have JROTC, and is strongly opposed by San Francisco's other Assembly person, the popular Tom Ammiano. The bill is expected to go before the Appropriations Committee later this month. AB 351, co-sponsored by Mary Salas (D-San Diego), Michael Duvall (R-Yorba Linda) and Ma, would allow local school boards to grant physical education (PE) credit to JROTC cadets, counter to bipartisan efforts in recent years to tighten PE standards and curriculum. The military wants to use PE credit as a recruitment tool for JROTC. AB 351 is before the full Assembly, and will be voted on at Salas' call, possibly as early as Wednesday. AB 554, authored by Warren Furutani (D-Long Beach), goes the Salas/Duvall/Ma bill one better, allowing JROTC cadets to skip not only PE classes, but also art and foreign language studies. Furutani's bill is currently scheduled for a hearing before the Assembly Education Committee on April 22. Why are certain Assembly members so anxious to draw a big circle and bull's eye on the state legislature by joining forces with the Pentagon to defend the very programs now under attack by the international community concerned about child soldiering, just at the moment that our homegrown activist legal community gets hold of the issue? "There is an international consensus, represented by the 124 nations that signed the Optional Protocol, that minors should not be recruited into the military," says Dave Meserve, a key leader of the campaign for the Youth Protection Act. "The question is whether we, as Americans, are going to allow our government to ignore that consensus." Does the state legislature really want to weigh in on the Pentagon's side in its ongoing and frantic efforts to raise the troops necessary for the U.S. to maintain a military presence in Iraq, for the impending folly in Afghanistan, and for whatever comes next? As Lao Tzu once said, a journey of a thousand miles begins with the first step. Perhaps this is a step that the state legislature might want to avoid.